The Search: Rescuers resumed their search Monday for a Hawthorne man who failed to return from a day hike in Yosemite National Park, a YNP spokeswoman said. Resources: A dozen helicopters, 74 ground teams and six search dogs. 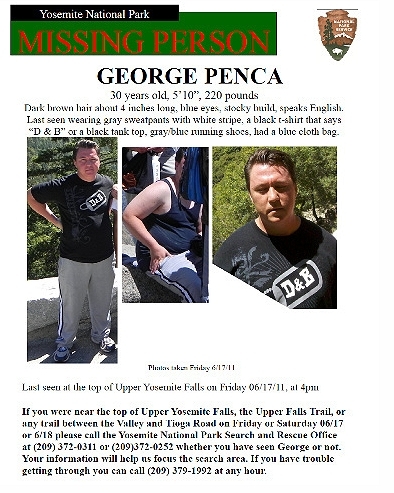 Victim: George Penca, 30, who was last seen Friday at the top of Yosemite Falls, where he was hiking with his church group. The group of 20 hikers separated for the trip down the Upper Yosemite Falls Trail and assumed Penca had gone ahead, said park spokeswoman Kari Cobb. Penca was reported lost about 9 p.m. Friday. The hikers were part of a larger group of 50 to 80 park visitors from the church, some of whom have stayed behind awaiting Penca's return, she said. The name of the church and its location were not immediately available. There is reason for optimism: The 3 1/2-mile trail with an elevation of 3,000 feet is visible from Yosemite Village and has water at the top. Weather conditions over the weekend, with overnight temperatures in the upper 40s, were fairly mild, Cobb added. "All the conditions are favorable," she said. Search-and-rescue teams from Mono, Mariposa, Fresno and Marin counties are helping with the search, she added.